Grab The New NFL RUSH ZONE: SEASON OF THE GUARDIANS And WIN A Copy! Enjoy the Emmy nominated Nicktoons animated hit again and again as Gaiam Vivendi Entertainment and the National Football League (NFL) release NFL RUSH ZONE: Season of the Guardians, Volume 1 on DVD. The release hit stores November 12th in Standard Definition (SD) for $14.93 SRP. Driven by animation from Rollman Entertainment, Inc. and producer Eric S. Rollman (former President of Marvel Animation), NFL RUSH ZONE: Season of the Guardians is sure to entertain children of all ages. 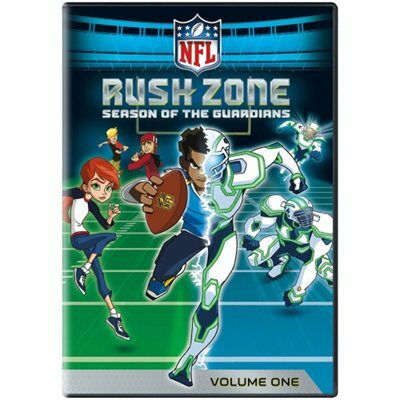 NFL RUSH ZONE: Season of the Guardians is an original half-hour animated series based on NFL RUSH ZONE, the NFL’s online world for kids. The series debuted in November 2012 to critical acclaim and received high demographical ratings. More than 7.5 million viewers across the networks of Nicktoons, Nickelodeon and NFL Network tuned in for the airings of the first 11 episodes. Fans can find exciting new NFL RUSH ZONE offerings from dozens of NFL licensees this Fall in stores and online at www.NFLshop.com. Children can also interact and play games with all of their favorite NFL RUSH ZONE characters at NFLRUSH.COM/RZ, the NFL’s online world for kids and the inspiration for the show. 1. Which player was drafted #1 overall by the Raiders in the 2007 NFL Draft? 2. What Year was the Oakland Raiders franchise established?